The #1 Web Site On The Internet For CFS, FMS, and GWS. This site is unique in that it provide a treatment approach for battling these illnesses. Chronic Fatigue Syndrome (CFS) involves feeling fatigued for much of the day, and lasting more than 6mths. Fibromyalgia Syndrome (FMS) involves soreness in the soft tissues that lasts during much of the day. CFS, FMS and GWS are related, since many people in these groups have overlapping symptoms, and we will collectively refer to them as CFS/FMS. To see how similar GWS is to CFS, click here to view a comparison of symptoms in approximately 650 Desert Storm veterans suffering from Desert Storm Illness with symptoms of CFIDS, as noted in REFERENCE #9. The USA Center For Disease Control (CDC) reports that CFS affects over 500,000 Americans as noted in REFERENCE #6. * natural toxins such as H2S (i.e. hydrogen sulfide, that results when fungi and bad bacteria in gut ferment sugar). * toxins resulting from natural waste products produced by the body that are not filtered out properly (e.g. free radicals that cause "oxidation" of "good" molecules). Damage to enzymes due to bad molecules is a MAJOR issue since enzymes are used to regulate and synthesize MANY processes in the body. If a tiny bad molecule binds to a big enzyme molecule, it can take it down. Enzymes have a defense system to guard against this from occurring (e.g. thiols), yet if those defenses go down for a short period of time, the enzyme can go down, and sometimes permanently. Enzymatic damage is a BIG issue with CFS/FMS. Problems caused by genes (i.e. a pathology that runs in a family) are similar. Each gene produces a protein (all genes do this). And a bad gene (one that messes you up) typically binds to something good and alters its function, in a manner similar to that which is done by a bad molecule such as a heavy metal or a pesticide. We begin with bad molecules that goof good molecules. These good molecules implement important systems in the body, and when these support molecules go down, the system goes down. Below is a short list of systems that can go down, due to bad molecules. There are two big systems that involve fatigue. One is the NA/Dopamine neurotransmitter communication system. When this goes down, one experiences "Neurological" fatigue. Another system is that which produces ATP energy in the body. When this goes down, one experiences "Metabolic" fatigue. The customer of these molecules may not be able to differentiate where the fatigue is coming from unless they test for specific inhibited processes. All they know is the are tired and do not feel right. A big issue is how one feels over the course of a day. If they feel good during part of the day, this is a huge clue in itself. Also, it is encouraging, since it proves that body does have what it takes to feel good. If this is the case, one can try to correlate this with a biochemical parameter in the body to get a better idea as to the specific pathology. For example, if feeling good is proportional to blood sugar level, then sugar regulation is a major issue. If one is tired during the day and their Melatonin (hormone that puts one into the sleep state) is on at that time, which it should not be, then Melatonin regulation may be a major issue. If one feels tired after eating foods (such as sugar, fast carbo, meat) that ferment in the gut to produce a gas which inhibits ATP energy synthesis, then gut ecology is a major issue. Have you ever wondered what is in that gas that you pass after eating? It is often not oxygen. As you battle your fatigue, you must become acutely aware of how it changes over time, how it responds to medications, and how a pathology on a test is related. Ideally, you want to know exactly where the fatigue is coming from, in addition to understanding the host of other pathologies that you find in your tests that are adversely affecting your body. 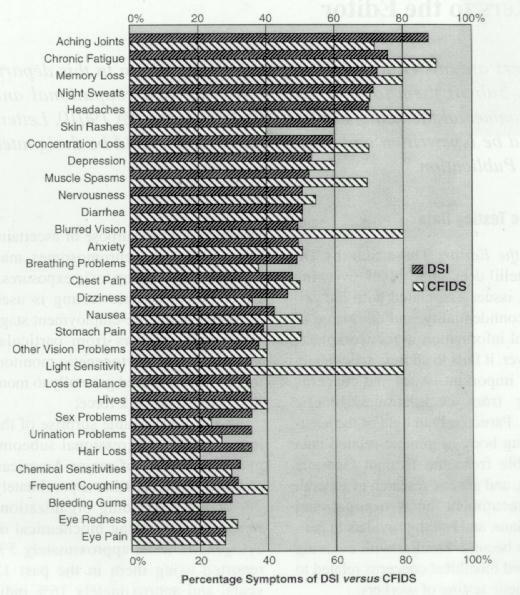 At the 1999 Sydney CFS Research Conference (please see REFERENCE #15 for details), it was found that folks with CFS tend to have high levels of tyrosine (p<0.04) and 3-methyl histidine (p<0.03) in urine. This could be caused by impairment of the tyrosine hydroxylase enzyme. If this enzyme does not use the tyrosine, tyrosine gets dumped into the urine. What could cause this? Bad molecules such as mercury, excess methionine, and H2S, and SO3 (these are poisons) that bind to tyrosine hydroxylase. The study also found that folks with CFS typically have low levels of succinic acid (p<0.0003) in urine. What could cause this? Anything that impairs succinate synthesis, which could be anything that depletes magnesium and/or anything that depletes succinyl-CoASh. What can do this? Bad molecules such as mercury. What happens when tyrosine goes down? The noradrenaline neurotransmitter goes down. What happens when the noradrenaline neurotransmitter goes down? Many things, including the regulation of energy in the body, which can result in fatigue. How does one test for this? They can increase their noradrenaline with an Rx drug for a short period of time, and see if they feel better. Bad Molecules and Good Molecules -- it is that simple. 1) You have a well understood disorder that has not yet been identified due to not testing for it. Have you ever heard someone say, 'I was sick for X years before I was diagnosed properly?'. This may be you in the future. 2) You have a disorder that the scientists understand yet we do not have a good test for it, and your Doc has never diagnosed it in his/her lifetime. 3) You have a disorder that has yet to be understood. Cases #1 and #2 are the most common; whereas #3 is quite unusual. Click here to learn about Gulf War Syndrome. It is always possible that the patient has a disorder that is understood, yet a test to see it does not exist. Lets say a patient is exposed to a poison (e.g. heavy metal, pesticide, chemical) that disables internal enzymes. An Enzyme is a molecule that converts one chemical into another. Most medical doctors, scientist and health care professionals know that in large quantities there are many substances that cause serious problems. However when the quantities are small scientists are less likely to have physical evidence that a real problem exists. To complicate things further, it is possible for one to be exposed to a poison (e.g. heavy metal, pesticide, GW chemical) several years ago, the offending molecules stick to the inside of the cells, the person excretes the remaining offending molecules until they are gone from blood, the person is then tested for these molecules in blood, hair and urine; the test is negative since they have already been excreted, yet they still exist, inside the cells, bound to enzymes, causing problems. Imagine that a heavy metal atom is affixed to an enzyme molecule and has disabled it's function, and there are also free heavy metal molecules in the blood that are not doing harm. To see this problem, you would want to measure the number of atoms that are doing harm, yet merely measuring the total number of atoms in blood would not be significant. There exists much research on the affects and diagnostics of high levels of harmful molecules (e.g. 50x times the recommended safe level), where the patient is very sick and one can see a high dose in the urine, yet very little research on the affects of lower levels (between 3x and 20x above safe levels in urine), especially when it is very difficult to detect their binding to internal biochemistry. Sick individuals tend to have limited ability to cope with the physical aspects of their illness and tend to exhibit a low frustration tolerance for difficult situations. Many have difficulty staying on task without much support, or assistance especially when the "establishment" invalidates their concerns and offers limited hope and or concern for their recovery. Many, frankly do not have the energy to sustain a persistent search for a solution. It is easy to understand how discouraged one might feel when test results do not support the existence of illness, or when a medication did not work well, or the medicine produces serious undesirable effects. Frequently when this happens a health care professional has been known to say something like, 'it is all in your head' and comments like this further the level of frustration and isolation that many feel when they are faced with the consistent lack of support including the realization that a health care professional is saying in so many words, "You are physically fine, as the tests don't indicate any evidence of illness. What you really need is a psychiatrist.". Battling CFS/FMS is grueling work. There are several factors that contribute to the battle. Physically the person is not at their best to say the least. There is the associated poor concentration, and the poor energy. There is the physical pain associated with the illness. There is the mental exhaustion, the lack of support, the humiliation of feeling so debilitated and beaten down, there is the medicine side effects and on and on. If the sufferer of CFS/FMS simply delegates the recovery process to the HMO/insurance company then it is a matter of time of hoping, waiting and suffering. Some people, for whatever reason, are unable to act on certain information and some others will be unable to follow up on recommendations. Recovery from CFS/FMS takes courage and conviction, and it is the hope of this web site to provide hope and encouragement to promote change and health for all those suffering with this illness. What do you have to lose? EVERYTHING!! Here at BeatFmsAndCfs.org, we hope the sufferer of CFS/FMS will be moved to act toward their own recovery, to take responsibility for their own well being and happiness and to one day be free of the symptoms of CFS/FMS. It seems that the individuals who are able to commit to their recovery do show remarkable improvements. If you are unable to take serious steps to manage your own illness, you may need more time to suffer and to have other people manage your pain, and suffering. Hopefully there will come a time when you will be sick and tired of this debilitating illness and you will become willing to act in a responsible way toward your recovery. If you are not interested in becoming more responsible for your recovery then maybe you should click off now, and read no further. It is not necessary. If you are unable to take this illness seriously then it will take you. If you are able to move into the next phase of recovery, then get to work and expect to spend 1 to 3 hours a day on this for the next 90 days or so, and then 1Hr a day or so for a year or two. This web site is not advocating that it is easy, because it is not. In fact, it may be so complex, time consuming, aggravating and expensive; one may find themselves doing nothing. Many have fought and won before you, and we encourage you to learn from them, to search for known conditions, to look for clues of known pathologies that are difficult to identify with tests, and to treat all pathologies found. Those without health insurance who are unable to private pay for their health care may feel they are in a precarious circumstance. However, they should note that many with HMO/healthcare support have made little progress. So what good is it anyway? This web site talks about how one can fight the battle described above, and shows an example of how one individual, whom we refer to as George, overcame CFS/FMS, despite the obstacles. To communicate exactly what happened, over 100 pages of George's medical test results are published at this site. For details, click here. George purchased over 100 books on medicine, spent $7K on medical tests, spent $3K on vitamins and drugs, and worked about 2hrs each day for a year. Another example of someone who beat their CFS, in a similar manner as George, is Dr. Michael G. Samuels who worked at it for 2yrs. For his story, click here. For Melissa Smith's recovery story, click here. This is not easy work. If one wants to track down a difficult to see medical issue, it can cost between $1K to $30K ($2K to $8K is typical). Generally, one must weigh the cost of being sick (e.g. lost wages, reduced quality of life) against the cost of making oneself well, minus the risk of spending money that does not provide benefit. If one is loosing $30K a year due to their illness and has 30 years of a career ahead of them, then spending $10K will actually gain them money. Like $30K * 30  10K = $890K money. If however, one is still working, has meds that help alleviate symptoms, and has little extra money, then that individual may be less inclined to fight a several thousand dollar battle. This web site is about fighting a major battle, because that is what it takes to beat CFS/FMS (unfortunately). And the following books are helpful as well, yet not as important. For an overview of some things that can cause fatigue, click here. For a more extensive list, one can read the above books, get out a pad of paper, place two vertical lines on each page to divide it into thirds, and write down each disorder that you see on the left, the test for it in the middle, and the treatment on the right. For the most part, it is as simple as this. Simple in strategy. Enormous amounts of time and money in implementation. And who has the stamina to fight such a battle? Certainly not the HMO that averages spending $3K per person per year. And most of that goes to you in your last several years of life (i.e. that is when you start to pull some real bills). So the HMO may need to average $1K per year per person (this is an average) for people who are not at the end of the road. You may feel like you are at the end of your rope, yet that still does not qualify you for the big money. For big money, you need something like heart disease, cancer, a gun shot wound, or a stroke. Something that is life threatening, and something that the Doc's can see. Money and health care are closely related. In a sense, they are the same thing. The more money you spend, the more health care you get. The $3K per person per year that you give to the HMO/insurance company gets you $3K/yr on average of medical care over your lifetime. The people that you give this money to cannot spend more, on average. They don't have the money to spend more. And they have protocols (rules) that determine how far a Doc can dig (i.e. how many tests they can run) given certain situations. And the rule system (referred to as "protocol") corresponds to the $3K/person/yr budget. They know, for each rule system, how much it will cost them, given a large population of patients. There is nothing wrong with this. You get out what you put in. This is life. Complaining about it will get you nowhere. Additionally, the Docs are not familiar with practicing medicine where more money than $3K/person/yr on average is spent. The $30K/person/yr practitioner would be running 10 times the number of tests, and would be very familiar w/ what happens when one digs deep into one's internal biochemistry after testing many subtle parameters. This is why so many Doc's shrug their shoulders when the patient says, "My body feels sore. ", or "I'm tired during much of the day.". Dealing with those issues involves digging deep, running many tests, and spending much money  which is something they do not have experience with. In order words, they do not know how to do it. ). Many of the tests that are referenced at this web site and many that are mentioned in the primary books described above, mention tests that have never been performed by the typical primary care physician. This is part of the problem. When the typical CFS/FMS person talks to the typical Doc, they are often not talking to someone that understands this level of medicine. And yet those Docs are the ones that patients are delegating to solve their problem. This is like having the brakes on your car replaced by someone who does not know how to do it, and has never done it. The brakes are constantly not working, and the customer keeps going back to the same mechanic, or mechanics of similar skill. There do exists Mechanics that know brakes, yet the customer does not know how to locate them, or identify them when they are standing in front of them. The system is confusing and difficult to deal with for the unsuspecting customer. Yet if any of these 4 are false, the patient gets stuck, and the health care industry concludes, "yes this patient is stuck and there is not much we can do about it". This is where Integrated medicine comes in. Integrated is practiced by the CFS/FMS Docs. Integrated involves doing whatever is necessary to make the person well. Integrated is often not supported by HMO/Insurance companies due to it's cost. Integrated typically must be covered out of pocket. If the condition is not well documented in studies, the Integrated Doc proceeds ahead anyway. The Traditional drops the ball at this point. Too risky. Could make a mistake. The Integrated works with studies in lesser publications (there are a 1000 or so of these worldwide). And these studies may be only indirectly related (e.g. they involve test tube or animal experiments, instead of human). And the Integrated Doc draws on his/her knowledge of biochemistry and uses theory (i.e. they guess) as to what is occurring. And then they test their theory with an experiment (this is exactly what a scientist in a lab does). YOU are the experiment. YOU are the lab. For example, "Try garlic to kill fungus in your gut for 60days and tell me how you feel in 2mths.". The Integrated will draw on studies, protocols, and treatments done outside the USA. Integrated will use Rx meds, over the counter meds, herbal meds, vitamins, supplements (IV and oral) and whatever they believe "might" be helpful. Notice the word "might". The Traditional will not do "might", the Integrated will. Integrated Docs are MD's, who have a fine appreciation of science, biochemistry, and all research that has been done worldwide. This site recommends that one first give the Traditional an opportunity to solve the problem, and if they fail, go to the Integrated. And if one has been sick for more than a year, it may be time to switch. In Search Of The "Root Cause"
There is something in medicine that is referred to as a "root cause". This is one item that is the direct cause of all the problems. It is often difficult to find the Root Cause. In most cases, many issues are interrelated, and sometimes circular. For example, an upregulated immune system (one that is working harder to fight invaders) increases incidence of allergies (immune system becomes more sensitive), allergic reactions in gut lead to inflammation of gut wall, leading to more upregulation of the immune system due to bacteria/fungi leaking from gut to blood (more invaders to fight). Tests may show multiple problems in a vicious cycle. Yet what started it all? What is the root cause? Very difficult to tell. How would one fix this issue? Treat all pathologies found, simultaneously. For a list of helpful books and web sites, please click here. For a list of CFS/FMS clinics and people who advertise themselves as on line practitioners (e.g. MD's) who can help you acquire medical tests, please click here. If you are ready to begin this battle, please Click Here. Unfortunately, the authors of this site are not in a position to respond to many inquiries, due to being very busy researching CFS, FMS and GWS. We apologize if this is of inconvenience. However, if you really want to interact, please email Support@BeatCfsAndFms.org and place "BeatCfsAndFms Support" in the subject area. This site suggests that one spend money with various testing companies, medical practitioners, vitamin suppliers, drug companies, books, and researchers. This site is not involved in anyway with suppliers of goods and services. To demonstrate this independence, we list at least 2 or more of each supplier. This site is in no way providing medical advice. In order to obtain medical tests and meds, one must interact with an individual that is authorized to provide these items, and they in turn become responsible for your use of such items.